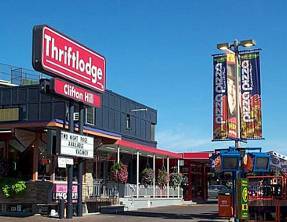 Located on Clifton Hill, the Street of Fun at the Falls, is the Thriftlodge Clifton Hill Hotel. This Niagara Falls Hotel offers comfortable accommodation at a reasonable price. Various room types are available in smoking and non smoking. Free in room coffee, local calls, Free on-site parking, Free High Speed Internet, are just some of the many advantages to staying with Thriftlodge Clifton Hill. The Thriftlodge Clifton Hill Hotel is the closest hotel to both the Casino Niagara and the mighty Falls. This Niagara Falls Canada Hotel is located in the heart of Clifton Hill, adjacent to the Casino Niagara and Ruby Tuesday’s Restaurant. The Thriftlodge Hotel offers guests with 38 smoking/non-smoking guestrooms and ideal location to all the attractions around the Falls. All guestrooms at this Clifton Hill Hotel offer wireless internet access, two double beds, air conditioning, cable television, telephones, washrooms with shower/tub combination, and all rooms have a patio or a balcony. TheThriftlodge hotel features free in-room coffee, walking distance to the Falls and all the major attractions, free parking, and free local calls.